I remember when I first decided that I wanted to learn how to cook. Looking back on it, I had pretty much always been subconsciously interested in food. I was (am) a total freak about eating certain things - for example, I have to eat Kit Kats by biting off the chocolate on the sides of the wafer bar thing first, then bite off each layer of the wafer one at a time. I think that at the time when I decided that was how Kit Kats had to be eaten, I was displaying kind of my own weird little kid passion for food. Fast forward a few years to the summer after my freshman year of college. Most of my friends were going back to their various homes for the summer, but I decided to stay nearby and work full time. I got a small studio apartment for what seemed like an exorbitant price of $385/month. Needless to say, I miss Pittsburgh rent prices. I was vegetarian and looking for ways to cook for myself that didn't involve Yves deli slices or veggie corn dogs. I did cook for myself but mostly it was just using TVP and Bragg's amino acids, so pretty much everything tasted like soy sauce. I wasn't so much interested in having a big recipe book or a ton of cookbooks and having to rely on them for everything, I was far more interested in learning what was needed to cook from scratch. It wasn't until I met my wife that I began really getting into the practice of cooking. As someone who cooks for fun, it's hard to find the time needed to really feel comfortable when faced with a grocery store and no idea what to cook, but after about 10 years of active pursuit with lots of trial and error, I feel like occasionally I actually come up with something decent. This weekend i went to the Union Square farmers market with no particular ideas in mind, I just wanted to come away with some cool stuff to cook with. I ended up getting some really great stuff - these amazing purple carrots with their greens, some red Russian kale (which I had never seen before), fresh onions, pork chops, and fresh picked ears of corn. I did a little research on what to do with carrot greens - I didn't want to just throw them out if I could help it - and I saw some other blogs with people doing carrot green pesto. I decided to base the whole dish around that, with some basic sauteed greens and a carrot and corn salad. Carrot green stems can be incredibly fibrous and difficult to chew, so we are just going to use the fronds. Pick the fronds from the greens and wash. Bring a pot of water to boil and blanch the greens for 1-2 minutes. Drain and press excess water out of the greens. Add to food processor with pine nuts, salt, and cheese. 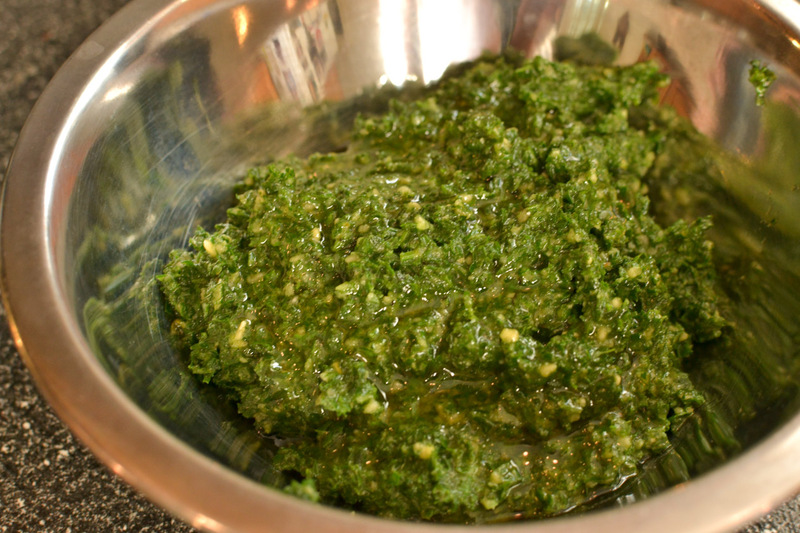 Start processing and add a steady stream of olive oil until the pesto starts to come together. Season to taste with more salt and olive oil. Set aside. 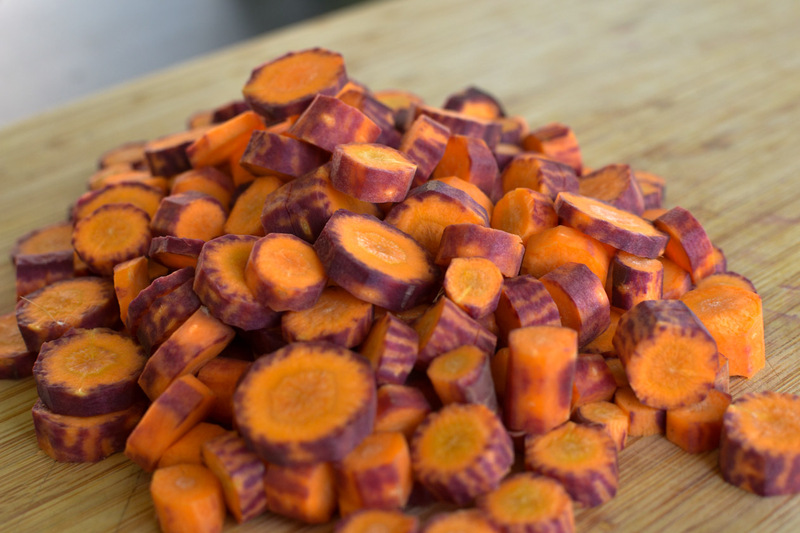 Peel your carrots and slice them thinly into little coins. Grill the corn until starting to brown on all sides, or if you don't have the means or don't feel like it, just boil the ears for approximately 10 minutes. Heat a small skillet on low and add the butter. Saute the carrots until heated through and softened somewhat but not mushy. Cut the kernels off the corn and add to a mixing bowl. Add the carrots. Mince the shallot and add to the bowl. Season with salt and pepper, add 2 tbsp of olive oil and the sherry vinegar and stir well. Season to taste with salt and pepper. This one is easy. Chop the kale into ½ inch strips. Dice the small onion. Heat up a saute pan and add a couple of tablespoons of olive oil. Add red pepper flakes. Saute the onion until softened, 3-4 minutes. Add the kale and saute until wilted, 5-6 minutes. Salt. Pepper. Grill. Or panfry in cast iron, that works too. 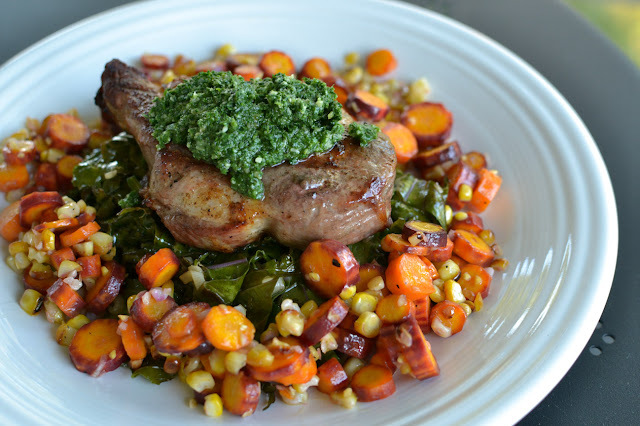 Place a bed of kale in the middle of the plate, place your pork chop on top of that. 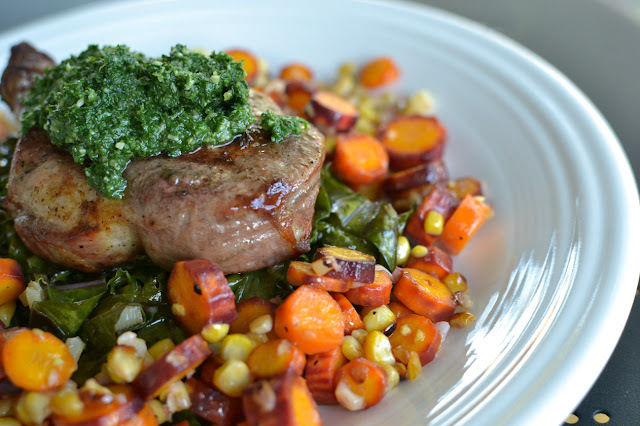 Top the pork chop with some pesto - maybe 1½ tbsp or so. Spoon the corn and carrot salad around the edges. I am not very good when it comes to presentation, but I thought this came out looking really nice. If I had to make a criticism, I would say that this dish was really crunchy. 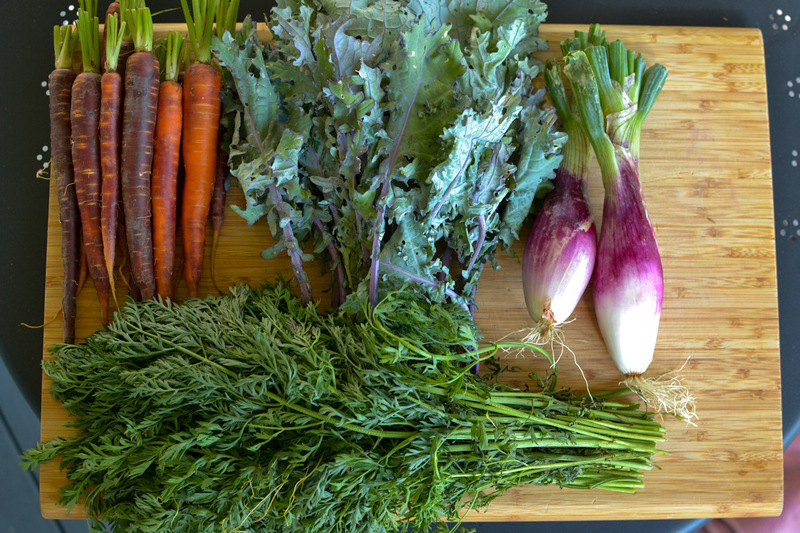 Like, the kale is crunch, the carrots are crunchy, the corn is kind of crunchy poppy. The taste was great all around, the flavors went really well together, but I would have to say that my jaw did get a little tired at the end of this, as weird as that sounds. I thoroughly enjoy your posts. Keep up the good work. Love the use of carrot pesto.